In 1878, when Martin Hubbard built the opera house at 25 East Main Street in Cambridge, there was already an opera house in town. Most small villages in the country had one. Shushan had one, Eagle Bridge had one, Greenwich had three. 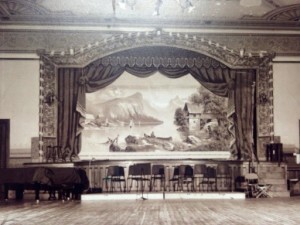 Now, 135 years later, Hubbard Hall is the last remaining opera house in Washington County, New York. One hundred years ago it was home to traveling road shows, church benefits, local concerts, high school graduations, town meetings, dress balls and chautauquas. Although the hall closed in the 1920s and remained unused for 50 years, it is once again a hub of cultural activity for its community. In 1978 members of the community formed Hubbard Hall Projects, Inc. (HHP), a not-for-profit corporation and purchased the building to restore and operate it as a community art center. This historic opera house, with its turn-of-the-century stage curtain, ornate Victorian gas chandelier, stenciled walls and chestnut woodwork, appears basically unchanged. Roof repairs, new fire escapes, rewiring, a new heating and air conditioning system, a rear addition, an elevator, and numerous other repairs have brought the restoration of the Hall up to the last stages of restoring the stencil work in the Hall. The restoration of the function of the Hall as a center for cultural activity, however, is in full bloom. In addition to the highly acclaimed artists drawn from around the world appearing in Music From Salem’s Chamber Music program, Hubbard Hall’s Variety Series , the Hall buzzes year round with children in the Children’s Theatre Groups; with rehearsals and performances by The Theatre and Opera Companies at Hubbard Hall and The Battenkill Chorale, with numerous art and craft classes for all ages, with music concerts and a full program of Dance, including dance concerts and a wide range of classes in movement from ballet to modern and jazz, and various ethnic traditions. The first floor of our Victorian architectural gem houses The Round House Bakery Cafe, run by Scott and Lisa Carrino, food is locally sourced and prepared fresh every day and The Valley Artisans’ Market, a gallery displaying the works of regional artists and craftspeople. All Hubbard Hall programs rely heavily upon patron support as volunteers and contributors. Hubbard Hall is located in the quiet farmland community of Cambridge, NY, between the Green Mountains of Vermont and the Upper Hudson River. By car it is approximately 1 hour from Albany and Williamstown, MA, 45 minutes from Saratoga and 35 minutes from Manchester, VT. 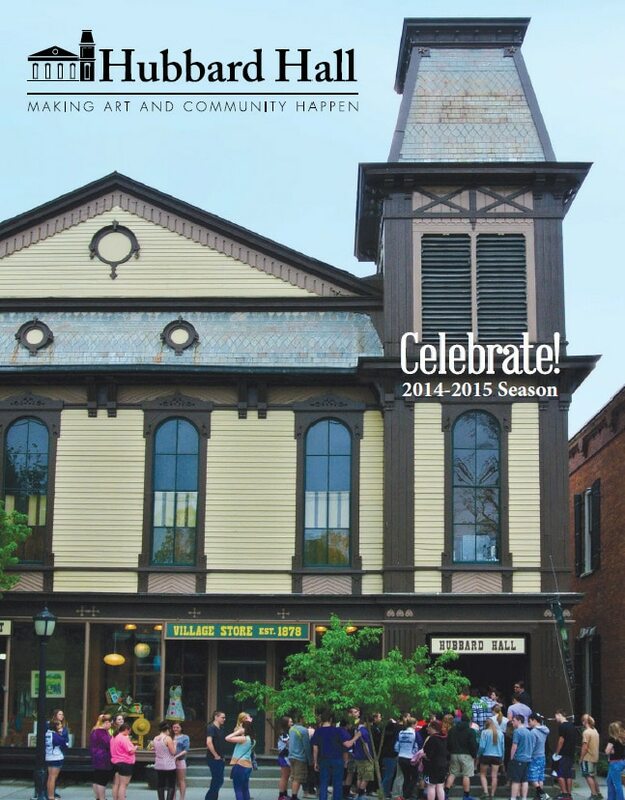 In 2014, our Season Playbill took the form of this commemorative journal celebrating the history of Hubbard Hall. Click to download. Anyone who would like to visit the Hall may call the Hubbard Hall offices at 518-677-2495.